What we see here are unpainted hardcopies of the Zuckuss action figure's head and right leg. Empire Strikes Back hardcopies are a lot more difficult to track down than Return of the Jedi hardcopies making these pieces even more special. Take notice of the color of the parts. Since this is a pre-1981 action figure it would normally be cast in a brown resin called Carbalon, like this Han Solo (Bespin Outfit) arm. 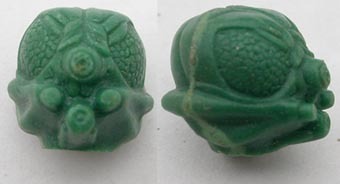 However, these particular pieces were cast in a green resin known as Dynacast, primarily used for post-ESB figures. This isn't so surprising, though, since it was one of the last Empire Strikes Back figures to be made. Hardcopies are created in such a way so that they can be disassembled. They are normally held together with either metal or plastic dowels. 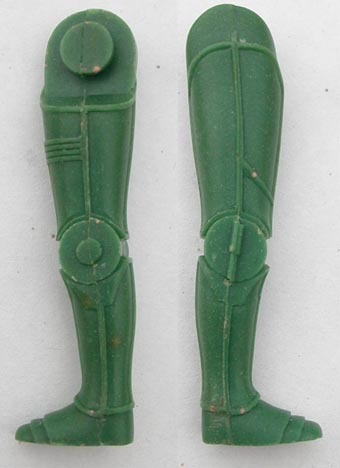 However, it's easy to see that this leg has disks built into it, meaning that this figure was sculpted in acetate as opposed to wax. Perhaps the coolest factor of these parts is that these are the first hardcopy parts to turn up for the Zuckuss action figure. Many first shots, like the one on this carded sample, have turned up but nothing earlier. I'd like to take the time to thank Bill for sharing these significant pieces with the SWCA and it's readers.